The best kids books are the ones witty enough to make adults smile, while still being interesting enough to children to keep their attention. 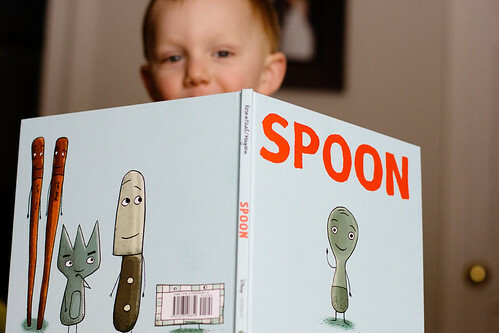 Spoon (another one by Amy Krouse Rosenthal) is at the top of the list of that kind of book. This one was a gift from my sister, and it became a fast favorite at our house. It's about, well, a spoon who envies the knives, forks and chopsticks of the world because of all of the cool things they get to do. In the end, he realizes that spoons have it pretty good, too. The best part of the book is the second to last page, when spoon and his parents are snuggled warmly in their beds in the silverware drawer and spoon says, "I can't sleep." His dad says, "Come, snuggle." And his mom says, "Come, spoon." I love it. P.S. I just saw this set on Amazon that allows you to get Little Pea, Little Hoot and Little Oink all together for a low price and as BOARD BOOKS! Which means no dust covers to get tattered and torn and pages that are a little more durable. P.P.S. Just FYI - we remove all dust covers from children's books at our house and keep them stacked in a closet. They're just a nuisance. I remove all the covers and throw them away. I love your book recommendations! I need to get over to Amazon and do some ordering. My kids even hate dust jackets...we do the same, though. Remove them, and after a while, they get pitched. I couldn't bring myself to throw them away! I felt wasteful or something. I'm not sure what. You guys have made me feel better about possibly tossing them, though.